I’ve been working on a few different papers and a book recently. One paper, “Prolegomena to Any Future Physics-Based Metaphysics”, critiques metaphysicians who appeal to false physical theories to attempt to establish some metaphysical thesis. In May I gave a talk based on this paper at the retirement conference of my advisor from Princeton, Bas van Fraassen. Another paper I’ve been working on, “Design Inferences in an Infinite Universe”, talks about how inferences to design are affected under the supposition that the universe is spatially infinite. I gave a talk based on that paper at Notre Dame in the fall. The book I’ve been working on takes issue with the various bad arguments against intelligent design in the literature. Even though I’m an atheist, I’m offering a partial defense of intelligent design — I argue that it’s legitimate to think of intelligent design as a science and that arguments for intelligent design are more plausible than they’re typically given credit for. I also argue that there are ways in which it’s a good idea for intelligent design to be taught in public school. I also got a few things published. The one I’m probably most proud of is a paper in Philosophical Quarterly called “Time Travel Without Causal Loops”, where I argue just that — that time travel can occur without causal loops. It’s one of these arguments that (in my opinion, at least) is clearly right, and yet some people have suggested the opposite, and that’s what makes it publishable. For more go to bradleymonton.com. I admit that I gave your email a few minutes’ careful consideration, since I am certainly fascinated by anything having to do with the origins and nature of life, and am myself an atheist. I also pride myself in being able to represent books from many different points of view. But in the end I just can’t get around my abhorrence of the concept of intelligent design. Part of me thinks that for that very reason I should read the book, just to see what I might be missing. If I had lots of free reading time I would probably do that, but since reading time is at a great premium, I have to reserve it for books that I might represent and not just for those about which I’m intellectually curious. I feel that I could never represent such a book and so it’s best if I not take even a step down this road. I find this response fascinating. I can’t imagine that it often happens that a literary agent is intellectually curious about a manuscript and yet turns it down without starting to read it. It’s this kneejerk emotional reaction to intelligent design that I’m trying to combat with my book. Just because someone is an atheist, and thinks that intelligent design is wrong, it doesn’t follow that they have to abhor the concept. In fact, I think it’s rather misguided to abhor the concept — it’s just a philosophical idea; it’s not going to do any terrible harm to the world. Yes, I know there are those who think that intelligent design is leading us into theocracy — but you would have thought the literary agent would have wanted to look at my manuscript, to see if perhaps I provide any evidence against that view. (In fact, I don’t really — for the most part, I set aside issues associated with culture and politics, and focus on what the doctrine of intelligent design is, whether intelligent design counts as science, and what the evidence for intelligent design is.) Anyway, I find his close-mindedness telling; I think that exemplifies one of the reasons that the arguments for intelligent design are so often dismissed for inadequate reasons. For more on my book, visit here. 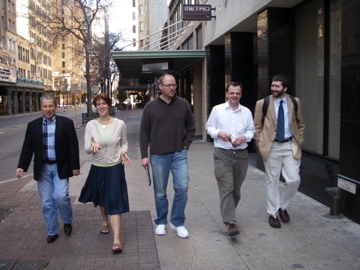 Here’s part of the posse from Jon Kvanvig’s wonderful philosophy of religion conference that happened in San Antonio in spring 2008. The main goal of this blog is to talk about the responses I get to my forthcoming book on intelligent design. But I’ll also discuss other philosophical (and semi-philosophical) issues on occasion.